The garden would not be possible without your generosity. Many thanks to all the residents who contributed to, attended, or otherwise supported this year’s Garden Potluck Party + Spring Fundraiser! Culinary highlights included caprese salad, spring rolls, pasta + veggie dishes, strawberry summer cake, strawberry ice cream and sangria. The raffle prizes, childrens’ gardening aprons and plush animal finger puppets, were a big hit! We appreciate all of the work, as well as the financial donations and community support for this special green space. The next potluck party is scheduled for Saturday September 20th. Save the date! 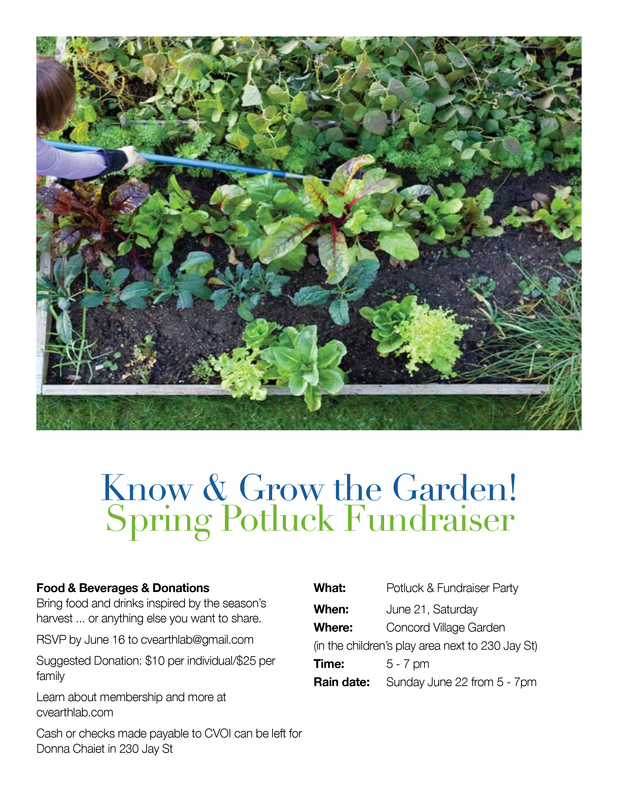 Fundraiser Sat 6.21: Join Us To Celebrate The New Garden Season! This is the work of donations and volunteer labor (thanks especially to Lee, Keith, Karin, and Judy for their assistance and supplies this season so far! ), so let’s celebrate it! We need more members to support this amazing, self-funded resource! We ask members to donate $10 per person (or $25 per family) to help us with the costs of keeping our garden safe, functioning, and growing (in addition to the bigger projects above, seeds, plant supports, compost — it all adds up!). We also need volunteers to help water and supply more mulch. Join us to celebrate and learn more about what we do and what we need! Click here to RSVP to cvearthlab@gmail.com. Thank you.